Ground was broken in the Town of Cheektowaga Tuesday on the spot where an apartment complex will expand to more than triple its number of units. When finished, many of the new affordable-housing units will be available to persons living with various conditions - including a diagnosed mental health concern. DePaul Group, which owns the Apple Blossom Apartments on Old Union Road, will increase its available units from 30 to 110 when the project is completed. The $37 project is part of Governor Cuomo's broader $20 billion housing plan that aims over the next five years to create 100,000 affordable homes, thousands of which will be designed to include supportive services. 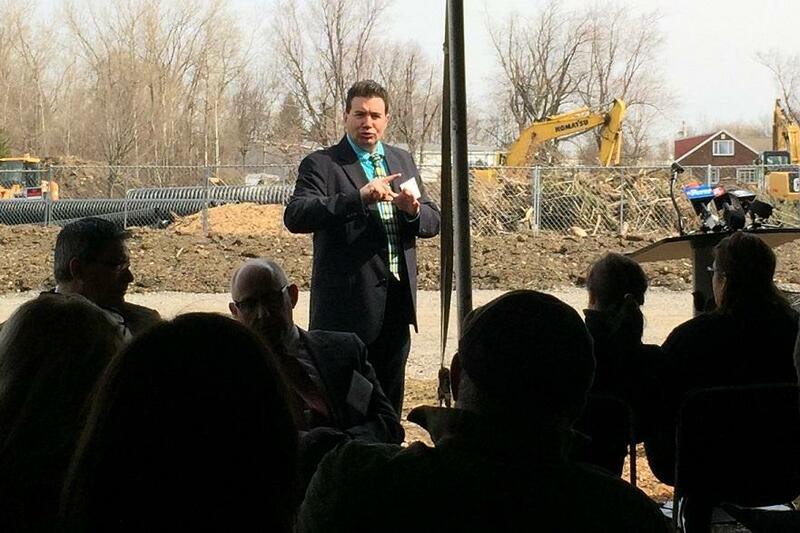 Anthony DiGiovanni of the Buffalo Deaf Advisory Board of Professionals offers remarks, while a nearby interpreter spoke his words, at a groundbreaking ceremony for the expansion of the Apple Blossom Apartments in Cheektowaga. The expansion will create new units designed to offer affordable housing to people including those who are hearing impaired, seniors and people diagnosed with and receiving treatment for mental health conditions. The units at Apple Blossom Apartments will include some designed to accommodate seniors, people who are hearing impared and people who have been diagnosed with a mental health condition which is being treated. "We will have 24-hour staff, security around the clock, staff who are fluent in sign language, staff who have skills with mental health clients," said Depaul Group president Mark Fuller. "We also will link with providers in the community to make sure that people get adequate health care or mental health care, transportation, shopping. We really provide a complete case management curriculum." Two new buildings will be constructed while the existing Apple Blossom building will be expanded to add new units. Cheektowaga Town Supervisor Diane Benczkowski was among the officials present for the groundbreaking ceremony. She explained that this project is close to her heart. "My daughter was diagnosed ten years ago wtih mental illness. Unfortunately, at the age of 27 in 2017, she committed suicide," Benczkowski said. "If a project like this would have been available to her, to be independent and still get the mental health services that she needed, I truly believe she would be here today." DePaul Group, a not-for-profit organization founded in 1958 and headquartered in Rochester, has had a presence in Erie County for 30 years, including more than 20 years in Cheektowaga.